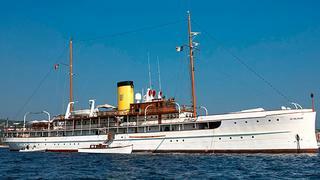 News now from Joost Goverts at Northrop & Johnson of a price change on the 78m steam-powered superyacht SS Delphine. Delivered in 1921, SS Delphine is the largest steam ship ever built in the United States. She was ordered by Horace Dodge and named after his only daughter Delphine. She had an impressive restoration completed between 1997 and 2003 with no expense spared. Accommodation is for 26 guests in two VIP suites, nine double staterooms and a four-bunk cabin. Power comes from two 1,500hp quadruple steam expansion engines. Currently moored in Tunisia, SS Delphine is down from €38 million to $39 million.